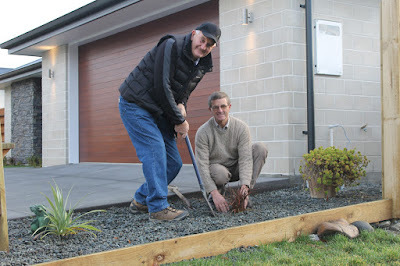 Chairman of the Rotary Club of Ashburton Development Trust, Roger West (left) and Trustee Don Williamson work on landscaping the house section. Rotary Club of Ashburton, NZ members are delighted their six month house build and landscaping project raised $70,000 for the club’s literacy projects. The completed house at 41 Braebrook Drive was sold to local couple James and Jo McCloy. The successful house build project was a first for the club, and the proceeds will fund children’s literacy projects in Samoa and locally in Ashburton. The club has led an aid project in Samoan schools with support from other clubs in Rotary District 9970, including the neighbouring Rotary Club of Ashburton Plains, since the devastating tsunami of 2009. To date hundreds of library bookcases have been built and thousands of new and used books delivered to Samoan schools by Ashburton Rotarians with help from the Rotary Club of Apia. Medical equipment and wheelchairs have also been delivered. The next step of the project is to provide thousands of early readers to schools. Locally the proceeds from the project will fund the club’s Books for New Entrants programme for the next two years. The programme which has been running for two years delivers a NZ authored book to every five year old starting school in the Ashburton District. The businesses who supported the build were recognised at the club’s Rotary meeting on June 23 with certificates of appreciation.